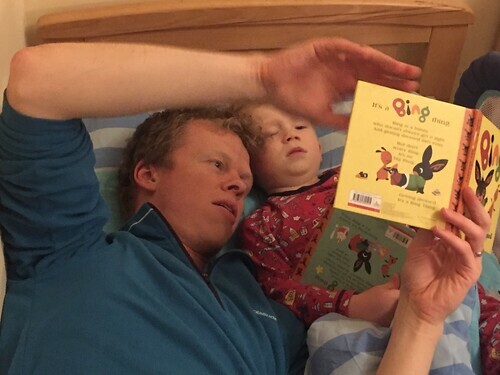 The Little Mister absolutely loves books and reading and I think he mainly gets that from his Daddy! Every evening they read several books, his favourite ones being Julia Donaldson books which have fabulous rhyming and rhythmic words and fab pictures. His Daddy can now recite most of the books and it would seem The Little Mister has as good a memory! I love these two wonderful boys. We are hugely blessed. 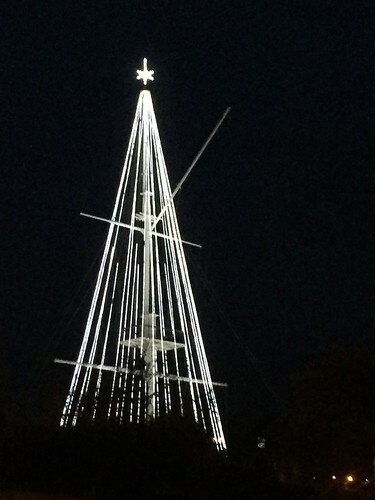 I know Christmas is coming when I can look across the town seafront in Guernsey and see the Tree of Joy, beautiful and illuminated. Perfect for the first Sunday in Advent which signifies hope. 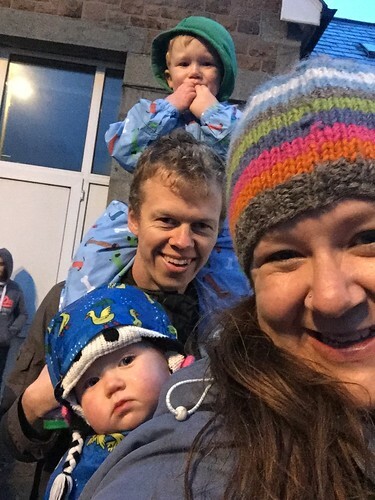 This afternoon we went out to see Father Christmas in town and switch the Christmas lights on. The weather was pretty awful but we were suited and booted and it was fine. The kids look as though they aren’t exactly thrilled by the experience though! I love this peculiar little island on which we live but sometimes Guernsey people drive me insane. It seems to me that they like to have a really good complain about almost anything and everything. Our local ferry service is having a pretty difficult public time at the moment (and deservedly so as their service has been diabolical) but you would think that the entire world had ended that way some people fo on about it. However, this letter to the local paper today has really taken things to a whole new level. 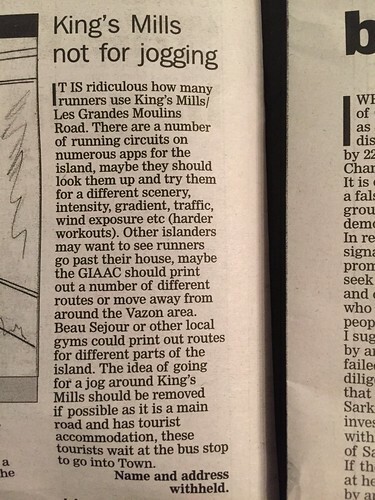 Whoever this person is is complaining about people out jogging on public roads. The might offend the tourists for goodness sake! Genius!! I love this little face. She is such a character these days and I am so relieved that she is back to her cheerful best after feeling poorly earlier this week. 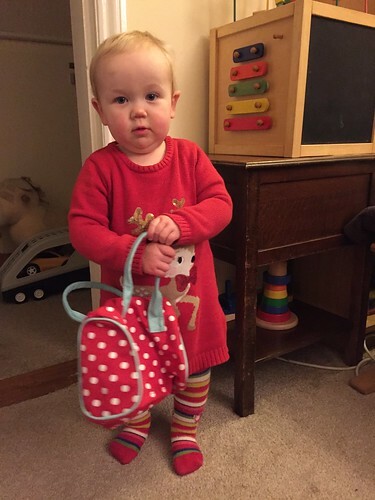 She loves this little handbag that was given to her for her birthday and she wanders around with it hanging off her arm like Margaret Thatcher. Check out the nice seasonal jumper too. That was a nice little NCT sale purchase! 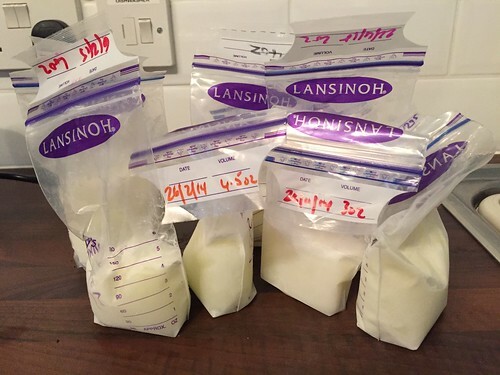 So here we have an end of an era – I have finally thrown out all the breast milk that I had pumped and frozen. I thought it was about time I binned it as some of it was over a year ago! When I thought of all the hours I spent expressing and how boring and frustrating it was it seems a shame just to dump it. I am just grateful that I was able to provide for my daughter in this way. I am also proud that we stuck it out because it wasn’t always easy but it was incredibly rewarding! I am sure in the not too distant future that our breastfeeding journey will come to an end. It has been a special time for all of us, and I am sure that when it comes to an end there will be tears, but we will move on to the next stage in all our lives. *sigh* my babies are growing up! The Little Mister went back to pre-school today after being off for a week unwell. I received a phone call at 11ish saying that his rash was back up and he had gone all cuddly. By the time I got there he was asleep in the book corner, snuggled up really comfortably. Bless him. 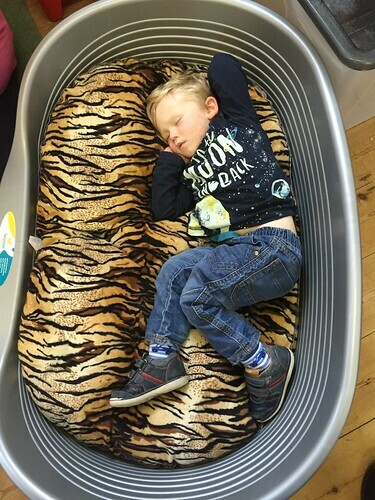 He is definitely on the mend, but I think pre-school was a bit much for him today! 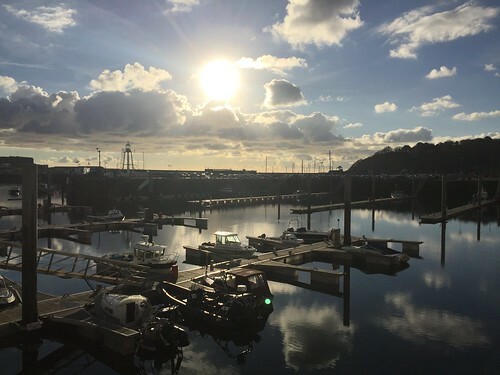 Today I had to go to a meeting at probation in St Peter Port. It has been such a beautiful day, sunny but a bit chilly in the wind. I managed to quick snap this picture on the way past the harbour and hoped it would turn out OK. I rather love it though. It feels quite moody! My lovely Dad came for lunch today. So nice to see him and the kids were pleased to see him. The Little Miss really isn’t terribly well today and she has been whinging all day, in fact she has been making this pathetic crying noise for large chunks of the day and I think it is mainly due to having several teeth coming through at once. The kids love Grandpa. 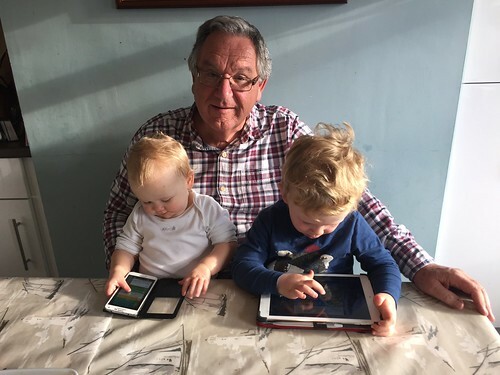 I mean there is so much about him to love, but mainly they love his iPad and phone! 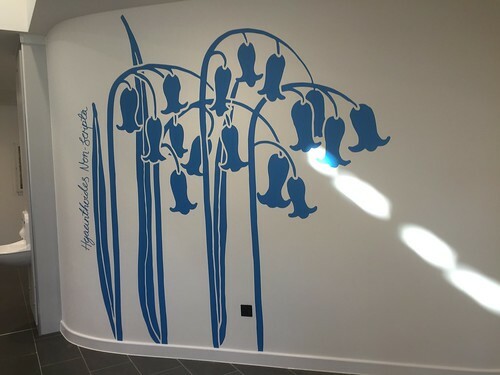 Today I spent a few hours at the new mental health centre in Guernsey which is called The Oberlands. The new unit contains the two mental health wards as well as day services and community services. It is a lovely, bright building which should provide a much better environment for our service users. There is also some lovely new pieces of art work around the building and I particularly liked this one.